How does a love story end? Marriage and Happily Ever After….But, how often does one really get a “happily ever after”?!! Tommy and Tuppence – Our young adventurers from “The Secret Adversary“, are now married. Although they are leading a happy and comfortable existence, it is routine, monotonous and in Tuppence’s opinion – boring. She is yearning for those adventurous days. And just then re-appears Mr. Carter, to grant her wish such that life partners Tommy and Tuppence become “Partners in Crime. This collection of short stories by Agatha Christie was first published in 1929. However, the stories appeared individually much before that in magazines. The proposition that Mr. Carter brings to our young daredevils is to take over a detective agency – “Blunt’s Brilliant Detectives” – which until recently was used as a spy center by the Russians. Tommy and Tuppence are to replicate the original owners – Mr. Theodore Blunt and his confidential secretary Miss Robinson – and continue to intercept enemy messages coming through. The perk here is that they are allowed to run the agency in whatever way they fancy. Tommy and Tuppence take to the idea enthusiastically and rope Albert (the young lad who was so fond of detective stories and who helped Tuppence in “The Secret Adversary“) in to play the office boy. They create a library in the office which is full of popular detective fiction of those days and during each adventure they fashion themselves as one of the famous sleuths including our dear Sherlock Holmes, Hercule Poirot and others. It is impossible not to fall in love with these young fools with a knack and doggedness to pursue the criminals with the recklessness that comes out of not only bravery but innocence and naivety. They do face a few disappointments, but with some courage, ingenuity and a fair bit of luck they do really well as “brilliant detectives”. Let’s go through the adventures one by one. Now, Tommy and Tuppence have the detective agency and are bursting to show their talent. But, there is only one element missing – clients. Well, if you can’t get clients, you have to create them, isn’t it? Yes, in this little story Tuppence goes and creates their first client. That way, the mystery of a missing girl is solved even before her lover finds that she is lost. And where does a pot of tea come into picture you would ask? Well, life would never be quite the same without a cup of tea, will it? The inspiration for this piece of work comes from Herbert George Jenkins’ famous detective Malcolm Sage. Chronicles of any detective will be indeed incomplete without a mystery that would involve stolen pearls of a lady of rank. Here it is Lady Dora Barton, staying with Colonel Bruce, whose valuable pearl is stolen. In true spirit of an amateur sleuth Tommy has bought a sleek camera and so he decides to play Austin Freeman’s Dr. Thorndyke. While there are no interesting fingerprints or footprints left to investigate and Lady Dora is supposedly a kleptomaniac who could have faked the robbery, Tommy does get one of his intuitive moments and they resolve the mystery successfully. Tommy and Tuppence finally receive the first Russian letter they have been waiting for. While they are eagerly discussing ramifications of this event, a stranger appears in the doorway with a see-through tale to get them away from their office. Right on the heels of the stranger, shows up an inspector from Scotland Yard who happens to know all about these plans by the gang to search the detective office and steal the letter. Tommy and Tuppence cleverly enact detective brothers Francis and Desmond Okewood from Valentine Williams’ book ‘The Man with the Clubfoot'(Published in 1918), and get the villains arrested. One fine morning, Tommy and Tuppence are reading the newspaper. While Tommy points out the interesting fact that the dots on the masthead of the paper appear on a different place everyday, Tuppence gets intrigued by an advertisement in the paper mentioning about finessing a king. Being a good husband, Tommy has to accompany Tuppence on this supposedly fun-filled evening that comprises of dancing, fancy dresses and a late night meal at a popular haunt. They notice a woman dressed as queen of hearts and a man dressed in newspapers go into the booth next to them at the restaurant. They seem to hear a woman’s scream, followed by a man’s laugh and then watch the man leave the booth. On an impulse, Tuppence checks the booth, but only to find the woman stabbed and dying. Her last words indicating that it was her lover who did it. Next morning Tommy and Tuppence meet the lady’s husband who finds it very hard to imagine that his best friend was having an affair with his wife and actually killed her. The case seems very straightforward. But, that doesn’t happen in detective fiction, does it? So it is left for Tommy and Tuppence to follow Tommy McCarty and Denis Riordan from Isabel Ostrander’s story ‘The Clue in the Air’ (Published in 1917). Since they just witnessed an actual murder and solved it, the confidence is running high at the detective agency. Tommy and Tuppence decide to follow dear old Sherlock Holmes when a major Stavanson approaches them with a task of finding his missing fiancee. The adventure is exciting, but short and neither Tommy nor Tuppence could have imagined what they would discover on this quest. Holmes was much better rewarded for his labors in “The Disappearance of Lady Frances Carfax” (Published in 1911). Tommy decides to hone his sensory perceptions and therefore invests in expensive black shades to replicate Clinton H. Stagg’s blind detective Thornley Colton. While enjoying a lunch at a restaurant called Blitz with Tuppence, he is approached by a duke and his friend. The duke and his friend are a bit perplexed that the famous detective is blind, but they go ahead with their request for his help. The duke’s daughter has been kidnapped under peculiar circumstances. Their need is urgent but not so as to dissuade Tommy from drinking a big cup of coffee and ordering his meal for the next day. The duke successfully divides Tommy from Tuppence and takes him to the base of the enemy Russian group who has been running the detective agency. In true fashion of gang headquarters, the room is full of electric needles making it impossible for a blind person to move. But is Tommy really blind behind those shades? Or as slow as he generally appears? Actually, he comes out of this with quite the flying colors. Our dear young adventurers have just had a defeat while trying to solve a case and they retire to the solace of cocktails in a nondescript village restaurant. Here they unexpectedly meet an old friend and a famous actress Gilda Glen. Beautiful Gilda is shocked to see Tommy as a Catholic Priest (Tommy’s favourite detective today is G.K. Chesterton’s Father Brown). She seems afraid of something and requests Tommy to come and meet her at the white house where she is staying. It is mist everywhere and Tommy and Tuppence have that forboding feeling on their way to the house. Rightly so, as they arrive to the house only to find the dead body of Gilda Glen. They lost their original case but finally they do resolve this one. Slowly but steadily, the detectives are solving the cases. So, it is time to expand and get bigger shelves in order to house the works of Edgar Wallace. Also, in the true spirit of Wallace, Tommy and Tuppence take on a gang that is circulating fake currency in Britain. Tommy does display some real good solid common sense, some tricks from Arabian nights (Alibaba and Chalis Chor) and knowledge of cats!!! Yeah, that’s right. Get ready to cackle with the Crackler…. Baroness Orczy is mostly famous for her stories featuring the Scarlet Pimpernel. But, our young adventurers are more impressed with “The Old Man in the Corner” (Published in 1909). Tommy acquires a newspaper cutting detailing the crime called “The Sunnigdale Mystery” and plays Bill Owen while Tuppence is Polly Burton. The crime involves murder of Captain Sessle with a hat pin on the golf course. There are eye-witnesses who saw a mysterious woman coming to visit him in late hours of evening on the golf course and claim that Captain Sessle played golf like a different man after that. His dead body was found the next morning. His wife was away on the day of murder. Police finds the mysterious woman and charges her for the murder, but she claims to be innocent. Thanks to Tuppence’s knowledge of women and hats and Tommy’s knowledge of the golf course, they come to a very different conclusion than the police. Are they right? Is there a way to bring this crime home to the real murderer? Miss Lois Hargreaves, young, pretty and rich, mistress of Thurnly Grange visits Tommy and Tuppence to report a case of arsenic poisoning. She has strong reasons to suspect that the person responsible for this was one of her household members. Lois inherited her fortune from her aunt Lady Radclyffe who intended to leave it to his nephew Dennis Redclyffe. But, Dennis did not live up to her expectations, and following a violent disagreement, she left everything to Lois. Lois came into this fortune very recently, but immediately made a will in favor of Dennis on her death. By the time Tommy and Tuppence arrive to Thurnly Grange on next day, Lois is dead and half the household is suffering from effects of a poison that must have been present in the dinner of the previous night. The case seems to be a dead end when they discover that Dennis also died early that morning. But, flashes of knowledge come from strange places and forgotten duties. Tommy and Tuppence do successfully solve the mystery in the style of French detective inspector Hanaud of A.E.W. Mason. Tommy parting shot being: “it is a great advantage to be intelligent and not look it”. 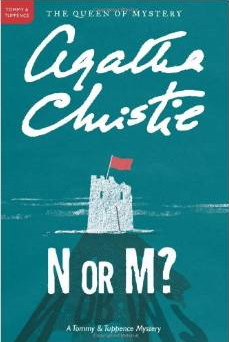 It was Agatha Christie who made alibis so popular when she devised an ingenious one in the “Death on the Nile”. But, here she references Freeman Wills Crofts and his Scotland Yard detective Inspector Joseph French as the inspiration for Tommy and Tuppence. We learn that young and sporty Miss Una has entered into a wager with impressionable Mr Montgomery Jones that she can be at two places at one time. Una produces two unbreakable alibis and Jones has to find out which one is a fake. Jones hires Tommy and Tuppence for this. After a fair bit of travelling and puzzling, they come up with rather a simple but entertaining solution to the mystery. Tuppence is quite in the Christmas spirit and declares that their next client would be a Clergyman’s daughter. This proves to be the case when Monica Deane arrives at their doorstep. She and her invalid mother are quite poor. They were very happy when they inherited a house from an aunt of hers. But soon discovered that there was no money, just the house. Monica received a few offers for selling it, but refused keeping in view her mother’s comfort. Instead, She decided to take some paying guests on to cover the expenses. But, the house seems to be channeling an evil spirit. Furniture gets thrown and broken with apparently nobody around. There have been enough incidents so far to drive the renters away. And now, Monica has received another offer for selling the house. Only she is convinced that it is the same man who offered to buy the house previously. What is in the house and why does someone want it so desperately? Tommy and Tuppence do solve the mystery and make the poor girl’s Christmas. This nice and sweet story would remind you of Anthony Berkely’s detective Roger Sherringham. Tommy and Tuppence feel highly honored as the US Ambassador Mr Randolph Wilmott comes to them with a strange case. His baggage was exchanged with Senator Ralph Westerham when he arrived from US and the senator’s valet came and corrected the mistake later. The funny part is when Mr Wilmott met the senator and mentioned this, he declared his complete ignorance of the matter. The bag contained nothing of significant but boots. Were the bags really exchanged? Why did someone want access to the Ambassador’s baggage? Tommy and Tuppence decide to follow H.C. Baileys’ Dr Reginald Fortune and Superintendent Bell. There is some adrenalin surging drama involving a beautiful blonde and a dark, dangerous foreigner who come to take Tommy on a wild goose chase. Albert shows his skills in handling a lasso and in the end they do find a gang of cocaine smugglers. This is a tribute to Agatha Christie‘s own Hercule Poirot as he chased number 4 in “The Big Four“. It is time for Tommy and Tuppence to resolve the final mystery of the Russian agents who were operating the detective agency before them. Mr. Carter teaches them the questions and correct answer that the mysterious Russian agent would be expecting – the code being number 16. The Russian agent does arrive and in spite of the preparations on the British end, manages to kidnap Tuppence from right under the nose of Tommy and Mr Carter. However, in the end, Tommy’s good common sense prevails and everything is sorted. The adventures started because Tuppence was bored from their routine life. But, she has another adventure now in tview, something that will be very trying and unpredictable. They are expecting a baby and so it is time for them to retire from the business of the detective agency for a while. We’ll meet them again in “N or M” and “By the Pricking of my Thumbs”. But, for now we leave them with best wishes for their future endeavors……. For any writer to be successful, the power of observation is very important. We have mentioned it before that Agatha Christie was such a successful crime writer because she had a very good understanding of human nature. Here, once again she proves this as she brings forth her ability of shrewd observation of her contemporaries and mimicking their work without being offensive. Detective fiction is so full of peculiar characters that sometimes display larger than life qualities – be it Sherlock‘s observation power or Poirot‘s grey cells or Thornley Colton’s senses. While this proves to be highly entertaining to the reader, it also sometimes appear to be not very probable scenarios in real life. But, Tommy and Tuppence are just the next door couple – not too bright, not too brave – but with a fair bit of courage and common sense. They are adorable and as Christie makes them imitate the famous fiction figures, their adventures become highly entertaining. This is Christie with a humorous twang as she delivers the stories that are one complete mystery each and yet connected by a common thread.